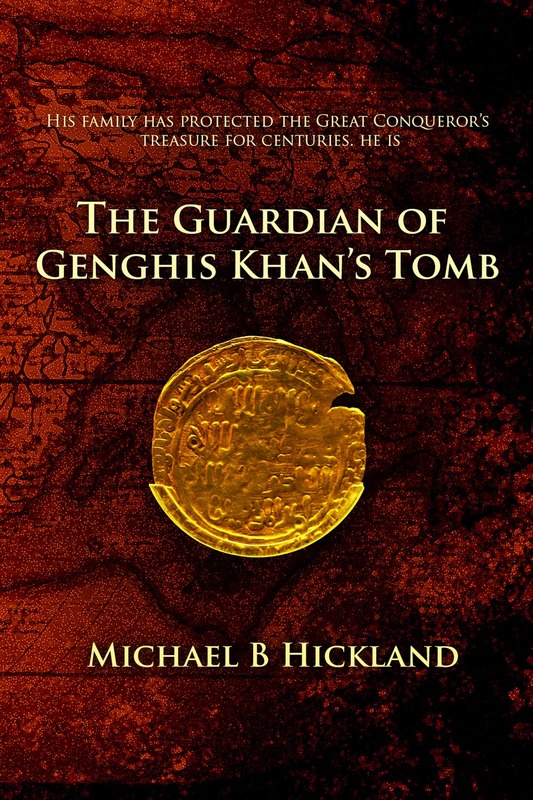 Today we are interviewing Michael Hickland, author of the tremendously engaging and imaginative historical fiction novel The Guardian of Genghis Khan's Tomb. I just finished the book and really enjoyed the perfect combination of adventure and history. For people who haven't read the book, please describe the plot of your book in a few sentences. Looking at a map today, Genghis Khan conquered a geographic area which including 30+ countries and 3+ billion people. He had amassed enormous quantities of jewels, gold and silver believed to be buried with him. Kate Barrows, a beautiful English scientist digging for fossils in Mongolia finds his childhood bow ignites a potential conflict among the superpowers. To find the tomb means capturing wealth capable of changing the world’s balance of power. Drew Moss, her American sponsor/financier, attempts to protect her and prevent a global war while excavating the lost crypt. The book would be enjoyed by anyone liking Indiana Jones and Lara Croft movies as well as readers of Dan Brown, Ken Folett and Clive Cussler books. I guess the 17 year old and up age group will love the adventure, romance and action contained in it. A business trip to Asia cemented the importance of Genghis Khan and inspired me to write the book. It is needless to say that Genghis Khan was my favorite character to write about. Not only did he create a country in Mongolia, but one of every 200 people on this planet carries his genes. To my mind he is the most complex and fascinating of all conquerors. How long have you been writing?I’ve been writing for about five years. My favorite book is “Tai-Pan” by James Clavell. It is a remarkable tale of the English traders that founded what is modern day Hong Kong. I read adventure/action books in addition to historical fiction. I think your readers will find both in my book. I was a Sales and Marketing executive whose first book “Seven Secrets of SuperSelling” provided its readers with a formula for being a top producing sales person for any organization. But my real love is history and the people in it that changed our world. I’ve evolved into a writer of fiction. For me learning to write dialog that draws in and holds the reader’s attention has the greatest degree of difficulty. It is something I’m always working on. English was never my favorite subject. History and Mathematics were. My impatience as a youth didn’t lend itself to the hard work needed for excellent creative writing. E books are undoubtedly the future of the industry. However, I lament the coming extinction of one of my favorite haunts-the bookstore. I plan to continue writing new adventures for the team of ex-Navy Seal /billionaire Drew Moss and stunning paleontologist Kate Barrows. Their romance will evolve. Perhaps the most surprising aspect of my writing is the fans and friends it has brought me. I have hundreds of Mongol readers and fans. My favorite experience with a fan is the friend and pen pal I’ve made with a fine Moroccan young man, Jamal Aidani. He is a very bright fellow. My family has been very supportive of my writing. At least my wife treasures the peace and quiet it allows her. Yes, I do get writer’s block and I usually resolve it by reading first rate thrillers like the books of Preston and Child. My computer has far too many rewritten chapters stored on it, but without my pc I would be mute. Currently, I working on a new one titled “The Sword of Amun”. It is set in Egypt and concerns the discovery of the grave of a very famous warrior. The exciting life of Genghis Khan including his conquests and massive treasure continue to influence events today. There is a very large National Geographic project currently under way to locate his lost tomb. International cooperation is permitting the use of the most advanced technologies in the search for it. It is important to note that this team of scientists is respectful of the reverence in which he is held by Mongols as their national hero. Disturbing the spirit of the Great Conqueror is not what they will do.